Hot, dry summer months are some of the most stressful times for plants in the landscape. Without adequate moisture, plants cannot function normally and can become predisposed to other stresses in the environment, such as winter injury or diseases. Particularly susceptible to drought damage are plants that have developed shallow root systems due to improper watering practices. More information on how to water properly is described in HGIC 1056, Watering Shrubs & Trees, and HGIC 1207, Watering Lawns. Water the grass to keep it green. Don’t water. Let it turn brown and go dormant. Watering keeps the grass green, but increases the need for mowing, encourages weed growth, can cause lawn disease and raises your water bill. If you decide to let your lawn go dormant, warm-season grasses like centipedegrass, bermudagrass, zoysiagrass and St. Augustinegrass will survive and rebound when favorable conditions return. Tall fescue may not fare as well. In some cases, extended drought can severely injure or kill tall fescue. Whatever lawn care option you choose, stick with it. Flip-flopping between the two can weaken your lawn. How to Identify a Thirsty Lawn: If you choose to irrigate your lawn during drought periods, do so efficiently. Water when the lawn shows signs of “thirst,” applying an appropriate amount at the right time of day. Footprinting: Walk across your lawn. If your footprints remain in the grass very long, the lawn is dry. Color Test: When a lawn is dry a long time, it will have a bluish-gray cast. Watering brings back the color. Check Leaves: Dry grass responds by wilting, rolling or folding the leaves. Watering Your Lawn: Once you have determined that your lawn is dry, apply about an inch of water. This amount should moisten the soil to a depth of 4 to 6 inches. If runoff is a problem, apply half and let it soak in before applying more water. Early morning is the best time to water. Irrigation timers should be set to water the lawn between 4 and 6 a.m.
Water your lawn only as often as necessary. Applying a little bit of water daily can be harmful, since it can encourage shallow roots. This makes the grass less drought-tolerant. Stretch the interval between each watering to encourage development of deep, extensive roots. Signs of Drought Stress: Drought symptoms can be very confusing and can vary with different types of plants. Woody plants under drought stress can have many symptoms including, yellowing, wilting leaves that develop early fall color and burning or scorching on the edges of leaves. Plants may drop some or all of their leaves and appear to be dead. Dogwoods are shallow rooted trees, and leaf scorch may occur on foliage after severe drought. Generally, most woody plants will usually recover when watered. Plants that appear to be dead, having dropped all or most of their leaves, might recover when watered. Always check closely first to see if a plant is dead before removal. Scrape the outer layer of a twig or the bark to see if a green layer exists indicating that it is still alive. Evergreen plants under drought stress typically do not wilt later in the season when growth has stopped. The new growth on evergreen plants often wilts when plants are under water stress. The leaves or needles can remain green up to several weeks after an evergreen plant has died. How to Water Trees & Shrubs Efficiently: The best time to water is in the early morning, when there is less evaporation and you can minimize disease potential by not extending the normal dew period. Drip irrigation that saturates the top 6 inches of the soil is the most desirable. Before watering, always determine first if the soil is dry by using a soil probe or digging down several inches with a hand trowel. Deep-water plants to wet the entire root space. Do not let the leaves and stems of plants get wet during watering. Newly Planted Trees & Shrubs: Give priority to watering these plants during periods of drought. Young plants have not had sufficient time to establish deep root systems, and depend on surface water for survival. 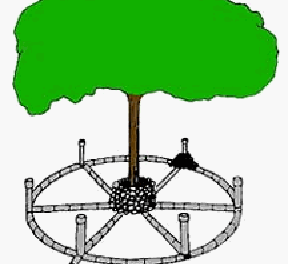 Do not to let the root balls of newly planted trees and shrubs dry out completely or become too saturated. Before watering, check to see if the soil is dry using a hand trowel or soil probe. Inspect these plants several times a week during drought conditions. Don’t forget that watering too often can also kill trees. Apply mulch around the base of trees and shrubs at least up to the dripline or outermost spread of the branches. Herbaceous (Non-Woody) Plants: Keep these mulched and apply water before wilting occurs. These plantings are usually the least expensive in the landscape and are usually a low priority during drought. Mulching not only decreases evaporation of water from the soil around plants, but it also lowers the soil temperature and helps to reduce competition from weeds. 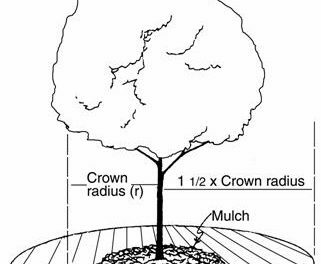 For trees and shrubs, coarse-textured mulch materials can be applied as deep as 4 inches. Apply fine-textured mulches such as grass clippings or shredded leaves no deeper than 2 inches to avoid matting. 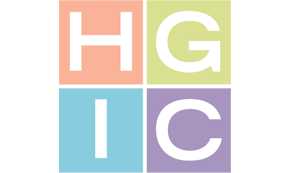 More information is available in HGIC 1604, Mulch.